Richard is a co-founder of Energy Aspects and contributes analysis across our research services. His areas of focus include the Middle East, global energy policy and geopolitics. Prior to Energy Aspects, Richard spent more than six years experience working with central government functions in both the UK and New Zealand. 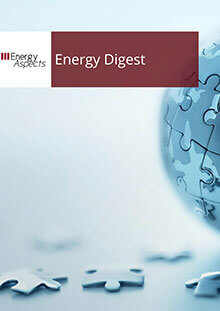 He regularly provides comments on energy markets for a wide range of media outlets. 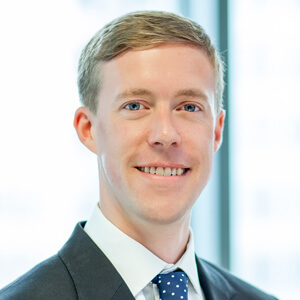 Richard holds a BA in Politics and International Studies from the University of Warwick and is a member of the Royal Institute of International Affairs (Chatham House). The collective gasp that you probably heard early in the week was triggered by the inversion of the shorter end (the very front part) of the Treasury yield curve. The 3-month treasury bill now yields more than the 10-year Treasury for the first time since 2007. 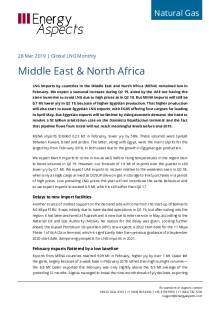 For many, especially those in the b..
LNG imports by countries in the Middle East and North Africa (MENA) remained low in February. We expect a seasonal increase during Q2 19, aided by the UAE not having the same incentive to avoid LNG due to high prices as in Q2 18. But MENA imports will still be 0.7 Mt lower y/y in Q2 19, because o.. 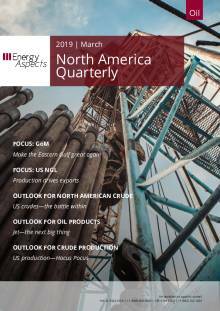 This is the March 2019 edition of our North America Quarterly (NAQ), previously released in February in prior years. We have adjusted our release schedule to coincide better with earnings seasons effective in 2019. As usual, it covers all important aspects of the region, with a particular focus o.. The trend of declining LNG imports by countries in the Middle East and North Africa (MENA) region notched up a milestone in January, as no cargoes arrived for the first month in over four years. Seasonally low winter demand played a part as did rapidly rising Egyptian gas production, which could..
LNG imports by countries in the Middle East and North Africa (MENA) region fell sharply y/y in December 2018, completing a year of continuous declines. The loss of Egyptian buying will continue to lead to y/y reductions in 2019, outweighing the more modest impact of Bahrain starting LNG buying an..